At 07.20 hours, ten minutes before Zero Hour, a huge mine was detonated under Hawthorn Redoubt in the VIII Corps sector at Beaumont Hamel. The position was a German strongpoint in the German line on the crest of Hawthorn Ridge. This was the only mine to be blown under the German positions north of the Ancre river. The agreement to go ahead with detonation a full ten minutes before the infantry attack at Zero Hour, and the fact that the heavy artillery was timed to lift off the German front line at the same time of ten minutes before Zero Hour, gave the German troops sheltering in their dugouts and bunkers forewarning that the British attack was imminent. The explosion of the mine was filmed by the British Offical War Cameraman Lieutenant Geoffrey Malins. At 07.27 hours two mines were exploded north of Carnoy on the XIII Corps front. 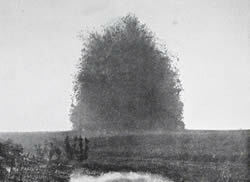 At 07.28 three mines were detonated on the XV Corps front under the German position known as The Tambour to the west of Fricourt. On this same corps front a mine was blown at Bulgar Point, a heavily wired German strongpoint south-east of Mametz, and four small mines were detonated under the German line at a place called Hidden Wood between Fricourt and Mametz. Also at 07.28 hours two very large mines were detonated on the III Corps front on the both sides of the Albert-Bapaume road. The mine on the northern side of the road was at a position called Y Sap. It contained 40,600 lbs of ammanol and was at the end of a 1,030 feet long gallery, the longest ever driven into chalk during the First World War. 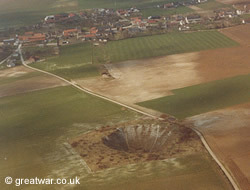 Aerial photograph taken in the 1980s of the huge crater left by the explosion of the mine at Lochnagar at 07.30 hours on 1 July 1916. The mine on the southern side of the road, near La Boisselle, was at a position known as Lochnagar. It contained 60,000 lbs of ammonal split between two charges at a depth of 52 feet underground. Following the explosion of the mines the battle on 1 July 1916 began with the British infantry attack at Zero Hour 07.30 hours along a front of about 18 miles from the diversionary attack on Gommecourt village on the left wing to the attack on Montauban on the right wing. a diversionary attack at Gommecourt on the northern, left wing of the attack front by two divisions of the British Third Army. a centre thrust of the British Somme offensive between Serre and Maricourt villages. This was carried out by 12 divisions in five corps of the British Fourth Army, totalling over 100,000 men. an attack astride the Somme river on the British right wing by two corps of the French Sixth Army. Over 100,000 British infantrymen started out from their assembled positions in the British forward lines at that time. 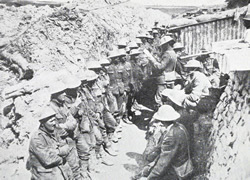 In some parts of the British line troops had crawled out in front of the Front Line trench before Zero Hour. At Zero Hour 07.30 whistles blew all along the British Front Line north of the Somme river. Thousands of British troops clambered over the trench parapet into No Man's Land, making for the German Front Line. Within the first hour of the attack the German defence inflicted heavy casualties to the British attacking force, resulting in the British being unable to reach their objectives for the first day in most parts of the battlefront. The German defences at ground level had been smashed by the preparatory bombardment, although the successful effect of the British artillery shells on the barbed wire defences in front of the German Front Line was varied. Crucially, a key defensive feature in the German positions on this part of the Western Front was the series of mined bunkers and tunnel complexes they had dug deep under the chalky Somme landscape. 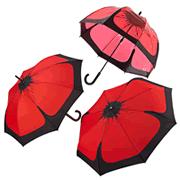 For the most part they advantageously withstood the hail of British artillery shells. Long months of intensive construction on this relatively quiet battlefront during 1915, with carefully sited strongpoints and machine-gun positions on deliberately chosen points of high ground, strategically positioned and fortified Intermediate, Second and Third Lines of defence, provided the German Second Army with a very strong defence in depth. The British bombardment had caused disruption to the German supply routes and had disturbed the mental strength of German troops subjected to the incessant noise and fear of death. Casualties in the German forward positions were serious enough in parts of the line for senior commanders to be concerned, but for the most part the protection afforded by the numerous large underground complexes in the forward and support lines helped to limit German casualties. As the British began their advance, the German troops who had survived caved-in bunkers and had withstood the mentally strenuous time of the bombardment carried out their well-rehearsed drill of climbing out from the protection of their deep bunkers to man the smashed-in trenches and, most crucially, their strategically-placed machine gun positions. This had devastating consequences for most of the men in the British battalions advancing towards them. Heavy casualties in so many sectors of the British attack, with large numbers of men wounded or killed by German bullets before they could even cross No Man's Land, resulted in only a few small successful gains of ground north of the Albert-Bapaume road. South of that road and on the far right wing of the attack the British achieved significant success on the front between Mametz and Maricourt, with troops of the 18th and 30th Divisions successfully reaching their objectives by the end of the day. The German defence was disorganized here, low in morale and successfully pushed out of its forward positions. The situation for almost all the divisions attacking north of Mametz village turned into a desperate day of disappointment and loss. Small parties did indeed reach some of their objectives beyond the German Front Line in places, but the overwhelming loss of thousands of British troops to injury and death within the first hour of the attack limited the possibility of supporting and reinforcing these gains by the end of 1 July. 1 July was a tragic day for the British Army. There were some 60,000 casualties by the end of that day, over 19,000 of whom were fatalities. Although the German regiments record relatively few casualties defending their line in the northern part of the battlefield two of their regiments in the south sector, where the British had successfully made a breakthrough, were decimated, each of them losing several hundred men as wounded, killed and taken prisoner. (1) History of the Great War, Military Operations, France and Belgium 1916, Sir Douglas Haig's Command to the 1st July: Battle of the Somme, compiled by Brigadier-General Sir James E Edmonds, CB, CMG, RE (Retired), psc. Macmillan and Co, Ltd., 1932, p. 315. Das Württembergische Reserve-Infanterie-Regiment Nr 119 im Weltkrieg 1914-1918, von Matthäus Gerster, Chr. Belsersche Verlagsbuchhandlung, Stuttgart, 1920.